In an exclusive interview with The Signal Monday afternoon, sitting Executive Vice President Aarjavi Patel alleged that presidential candidate Anthony Jones bribed her for her vote. Jones — who is poised to face Jazmin Mejia in a Student Government Association runoff election tomorrow — declined to comment on the allegations despite a now-active investigation launched by Chief Election Commissioner Jessica Siemer. For months, “Money Man Ant,” the pseudonym used by Jones on GroupMe, had shared suspicious images showing him receiving and sending thousands of dollars through Venmo. It was these questionable posts that led Patel, EVP for the Newton campus, to contact him directly to learn more about the transactions. In subsequent messages, Patel explained she would only vote for him based on his goals for his presidency. The next day, Patel said she was in a meeting when she received an alert on her phone that someone had sent her $100. “It went straight into my bank account, which freaks me out even more,” she said. Because Patel shares a bank account with her father, she was immediately concerned about how this transaction was possible and what her father would think of it. She said she then asked Jones if he was the one who sent her money, and Jones said his friend did using bitcoin. Because she was so confused by how he was able to get her bank account info, she deleted her entire Venmo account, she said. Patel said she wanted no part in Jones’ scheme, so she sought to return the money immediately. The two eventually met up and she personally returned the $100 in cash. Patel’s frustration with the situation stemmed from the notion that she said she neither agreed to the transaction nor agreed to vote for Jones. Patel was unable to provide any further documentation in regard to the payment, including any bank statements as evidence. 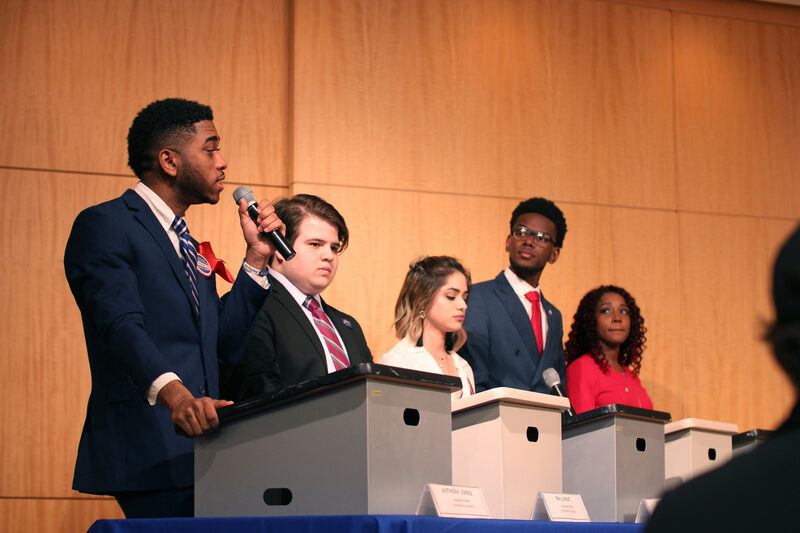 Siemer, the chief election commissioner and a graduate senator for the SGA Atlanta Senate, told The Signal she would need “a complaint with evidence and then we can move forward” in response to the multiple accounts of hearsay that she has received. While this story was still under development Wednesday afternoon, The Signal was informed by the Election Commission that an official complaint against Jones was filed at 1:08 p.m. The investigation has since begun, and depending upon the decision of the Election Commission, the ballot — and the future of SGA and Georgia State — could be drastically reformed in just hours. If the Election Commission were to determine Jones is in violation of the Election Code, he would be disqualified from the race. But that decision has a tight deadline: 5 p.m. today. According to Siemer, if a candidate was exchanging money for votes, this would be a violation of the Election Code — specifically under article 6, campaign ethics, section D.
“No person shall offer anything tangible or intangible of value or make any physical, emotional, or verbal threats to any voter to affect the student’s vote. The term ‘anything tangible of value’ is up to the discretion of the Student Judicial Board [SJB],” the code states. Siemer predicted this alleged violation would likely be class A, the highest possible offense which would result in “disqualification and automatic referral to the appropriate Dean of Student’s office,” according to the code. But, in Jones’ situation, since he already has three code violations, any more — regardless of their classification — would be disqualifying. “[Jones has] one class B and two class C violations as of now, and one more violation of any kind would be an automatic disqualification,” Sen. Christopher Garcia, a representative of the Election Commission, said. Candidates can always appeal alleged violations against them and have an official ruling made by the SJB. If the board agrees with the Election Commission’s ruling, Jones would then be officially disqualified. According to Garcia, there are several scenarios that could unfold if the aforementioned takes place. The ballot is finalized at 5 p.m. today, April 3. If the SJB makes a decision before 5 p.m., Jones would be removed from the ballot and replaced by the next runner up: Shay’na Fields. However, if he is removed from the ballot after 5 p.m., his opponent Mejia would become the only eligible candidate on the ballot and subsequently — without any further complications — become the next president. Due to the dynamic nature of this situation, The Signal will continue to update until the end of the election season, Monday, April 8. Update (Friday, April 5): Jones has been disqualified from the race. A previous update to this article incorrectly stated the Election Commission disqualified him for bribing a student to vote for him. In fact, the Election Commission disqualified him for violating campaign ethics, a section of the Election Code with wider interpretation. The campaign ethics violation did stem from allegations that he bribed a student to vote for him, according to the Election Commission. Barring any unforeseen events, Mejia will become the automatic winner of the runoff election. William Solomons and Daniel Varitek contributed to this story.